"The thread worked perfectly. Besides coming in delicious colors, it doesn't fill the machine with lint. My students fought over the luscious plum colors. 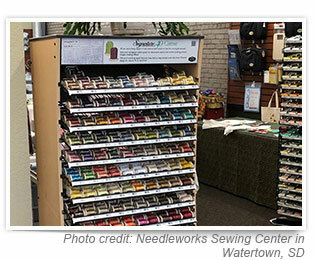 I highly recommend this thread to anyone who wants hassle free machine quilting." Signature®, with its variety of assortments and fixtures, can meet the needs of any retail setting. All fixtures are attractive, durable, store and customer friendly. 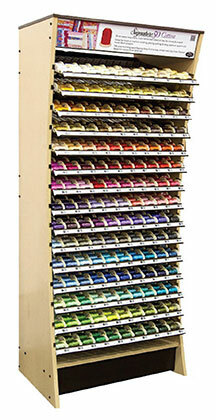 These fixtures allow for easy thread selection and supports effortless maintenance and replenishment for the store. The Curve mini king spool floor fixture effectively merchandises a complete range of colors for quick and efficient product selection. The pull out shelves greatly aid with maintenance and inventory replenishment. The Curve mini king spool countertop fixture provides a smaller footprint with the same attractive style as the Curve floor display for a uniform and appealing presentation of vibrant, top selling colors. 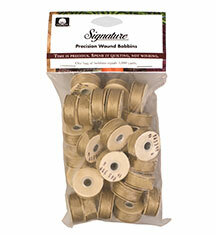 The wire cone fixture provides a wonderful merchandising option for Signature 3000 yard cones. It offers flexibility for standard peg board/slatwall mounting and placement on shelf/table options. *Customize by selecting 4 cones per color/per facing for a total of 72 cones per fixture. *Customize by selecting 3 cones per color/per facing for a total of 54 cones per fixture. 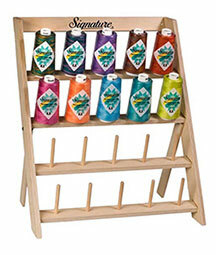 The Signature wooden peg organizer offers easy access and instant visibility of quilting cone threads. 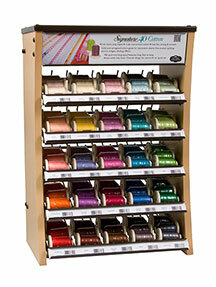 It is very functional for stores with long arm quilting services and a great addition to the home sewing room. 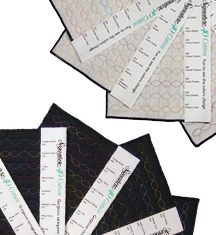 Perfect as a gift or as a last minute purchase at the register - these are great for both new and skilled quilters. Embrace the colorful seasons and spark your creativity. Perfect as a gift or as a last minute purchase at the register - these are great for both new and skilled quilters. 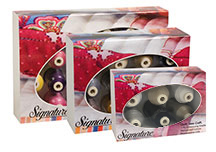 The Signature bobbins pack is conveniently packaged for the long arm quilter and instructor. 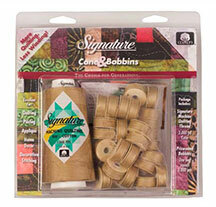 The Signature cone and bobbins pack is conveniently packaged for the long arm quilter and instructor. 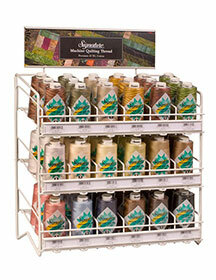 The Signature Fan Deck is a useful tool that displays both solid and variegated threads in 40, 50, and 60 weights. 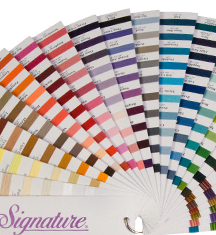 These are true thread swatches to show more accurately how the different thread colors represent in a stitch. The Signature Stitched Panels are a wonderful way to show how variegated thread displays on both a light and dark background.